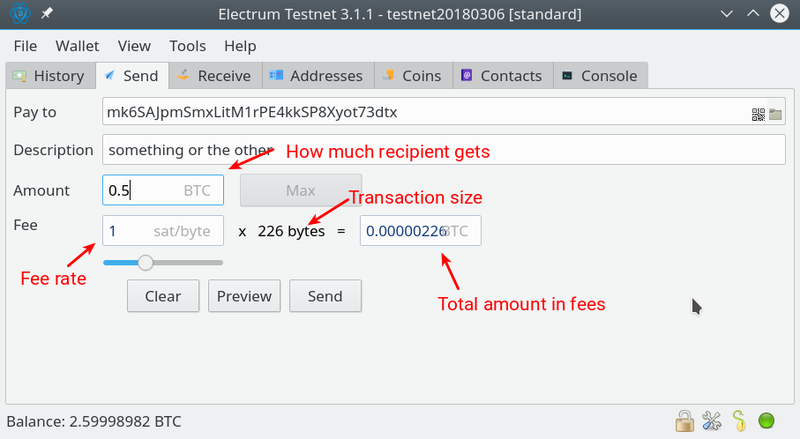 As you can see fees depend on the size of your transaction in bytes and the fee rate in terms of satoshis per byte. There are 100,000,000 (100 million) satoshis in a bitcoin. What determines the size of my transaction? The number of inputs and outputs determines the size of your transaction. If you regularly received small amounts of money from faucets or mining pools in the past your transaction would be very large because of the large number inputs so you would pay a relatively high fee. You can click on the preview button on the send tab to see how many inputs and outputs there will be in your transaction. I’m really cheap. Tell me how I can save even more money? Check “Use Replace-by-fee” under Tools menu > Preferences > Fees tab so that you can low ball the fee initially and bump it later on if you need to. Save the signed transaction to your wallet file so that you can rebroadcast it again if you need to. Low fee transactions get ejected from nodes’ mempools when they encounter higher paying transactions. Rebroadcasting them brings to the nodes’ attention again. To save the transaction right click on the transaction on the history tab, choose “Details” and then click “Save”. You can also do this on the send tab where instead of clicking send you click on Preview > Sign > Save and then click Broadcast to send. If the transaction status on the history tab says “Local” then you know that it has been ejected from the mempool of the electrum server you are connected to and it is time to rebroadcast it. You can do that by right clicking on the transaction, choosing “Details” and then clicking on “Broadcast”.